Got a repaint job and no idea of the colour on the wall? Want to match a fabric or swatch and you have no idea of which Resene colour might be closest? Or perhaps you have a colour sample and you’re happy to take a similar Resene colour, but you’re not sure which colour to choose? The Resene ColourHelper has been developed with all these projects in mind. Simply take the Resene ColourHelper, push it down to ‘read’ the target colour three times and it will let you know three Resene colours closest to the colour you have measured. It can also suggest complementary colour options, tell you the difference between two colours so you can see how similar, or different, they are and suggest other colours. When it provides colour suggestions it focuses on colours of the same colour type first, opting darker or lighter if need be to find a good colour option. If there is nothing close then it looks for colours which are left or right of the original colour on a colour wheel. Think of it as a handy shortcut to navigate your way faster to a colour that will suit your project without having to pore through every chart looking for something close. If a custom colour is required, the Resene ColourHelper can assist by providing a start point for the formulation. The Resene ColourHelper units can be used free at all Resene ColorShops and Resellers or when our representatives are out on site visits. The unit is battery powered and self sufficient so can be put to work wherever you might be. The hand-held device uses a tiny, built-in digital camera to take a micro-picture of a coloured surface. An embedded microprocessor in the Resene ColourHelper then analyses the micro-picture to determine the exact colour by comparing it against the database of Resene colours it holds. Each Resene colour has been painstakingly captured from original Resene colour standards using the same process using specially calibrated equipment in the USA to ensure the measurement of the colour standards and the target colour is consistent. The closest colour match is shown at the top of the display. On the left of each colour result, the Resene ColourHelper shows an upright rectangle with bars. The more bars in the rectangle the closer the colour match. The Resene ColourHelper can compare the colour to a pre-loaded database of Resene’s paint samples to identify the best match/es. This is useful when you have a colour and you want to find the nearest Resene colour. It is also useful for custom colours as you can find the nearest colours and then those formulas can be used as a start point for a colour match. It’s even clever enough to show you how good the match is using the bar indication system beside each colour. Knowing the best colour match, you can check to see if another product (such as a rug or a furniture fabric) is also the exact colour match. This is especially useful when you want to check if a coloured object in a store matches another item. If the colours aren’t the same, the Resene ColourHelper will even tell you how the second colour is different (e.g. too red, too yellow, too dark, etc.). 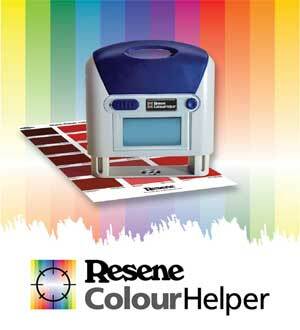 The Resene ColourHelper can advise whether two colours will harmonise. As with colour identification, the user takes micropictures of two coloured surfaces one after the other. Using proprietary software and mathematics, the Resene ColourHelper will suggest whether the two colours go well together, and if not, suggest an alternative. The Resene ColourHelper can suggest several good coordinating shades to use with a primary colour. It will suggest harmonising colours ranging all the way from ‘neutral’ to ‘dynamic’. If you are overwhelmed by the thousands of colours available and are not sure where to start, the Resene ColourHelper can help narrow the list. This is also helpful if you have a colour sample and are wanting some complementary colour suggestions. If you already have a particular colour family in mind, (e.g. you want a shade of blue, but are unsure which of the hundreds of possibilities will work best with a primary colour), the Resene ColourHelper will suggest good options within a colour family. If you own a Resene ColourHelper it can record colours so you can ‘take them anywhere with you’. You can, for example, record colours at home and then check colour matches and colour harmony of items elsewhere. This can be useful for corporate colours or similar. Using the special Resene ColourHelper data cable you can view the Resene ColourHelper results on your computer complete with colour swatches. The current Resene ColourHelpers are set to measure the surface three times. The unit then takes the average of these three readings and uses that to generate the colour suggestions. You can reset it to just read the surface once if preferred but the three settings is recommended. When taking a colour reading make sure you are reading off a representative part of the sample. If you are taking a colour reading off a magazine or thin item, ensure you place it on a flat white background first so that the colour underneath the sample does not affect the colour being measured. Paint on walls and surfaces can change in colour over time. The Resene ColourHelper reads the colour on the sample that is present now. If the colour has faded, is dirty/dusty or has changed since it was first applied, then the Resene ColourHelper will suggest a colour based on the current state of the colour, which may be different from the original paint colour used when the colour was first applied. The Resene ColourHelper uses the original Resene colour standards for its database and it averages the three colour readings it does. There can be some minor variations between this and our colour charts, which is why if you measure a Resene colour chart chip it will sometimes show another colour as being closer. When the Resene ColourHelper provides colour suggestions it focuses on colours of the same colour type first, opting darker or lighter if need be to find a good colour option. If there is nothing close then it looks for colours which are left or right of the original colour on a colour wheel. There is a separate database for woodstains and metallics. These are much harder to capture the colour because of the nature of the finish, which is why they are in separate databases on the Resene ColourHelper so you can select just metallics or just woodstains if you are wishing to match those items. Resene ColourHelpers are available for use at Resene ColorShops and Resellers. They may also be purchased. Please contact your local Resene ColorShop, Reseller or representative for more details. View as a pdf. (You will need Acrobat Reader).